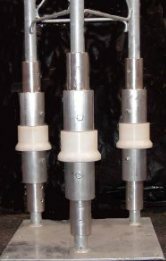 Pictured at left is one set of three tower insulators for 25G tower. For illustration purpose, these insulators are shown on a Rohn BPC25G (base plate). 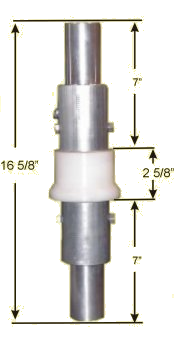 This tower insulator can be mounted at any desired height above ground between tower sections. All towers using these insulators must be guyed. ​The white portion of these insulators is the insulated material called "UHMW"(Ulta-High Molecular Weight Polyethylene). This insulating material was chosen after extensive consideration of all other materials options. It is ideal for this purpose because of its tremendous strength under compression (20,000 pound test). Dielectric properties capacitance measured at 5.1 pf nominal per leg. Hipot tested at 20Kv peak. They don’t flash, even at 30Kv. Tower insulator are designed for guyed towers only. Insulators must be in compliance with Rohn specifications. They are perfect for 4 square arrays or any Elevated radial system. Price for Rohn 25G set is $459.00 . There are several brands of tower that are similar in appearance of Rohn 25G. These towers can have slightly different leg measurements compared to Rohn products. If you are not positive that your tower is Rohn (for example you bought it used) it is a good idea to give us the measurements. ​We can custom build these insulators to fit many different brands of round leg towers.